As Cytoskeleton’s Custom Services Department continues to grow and expand its offerings, we wanted to take the opportunity to highlight some past research projects that benefited from work performed by Cytoskeleton’s Custom Services scientists. The three main foci of Cytoskeleton’s Custom Services are: 1) Compound Screening, 2) Assay Development, and 3) Gene Cloning and Recombinant/Native Protein Purification. The citations discussed below demonstrate our effectiveness in all three types of custom services. In Towle et al.1, the anti-cancer activity of two compounds derived from halichondrin B were characterized under in vitro and in vivo conditions. Cytoskeleton’s Custom Services Department participated in this study by screening the compounds for their effectiveness at inhibiting tubulin polymerization in vitro, as determined by IC50 calculations and comparisons against well-characterized tubulin polymerization inhibitors. The in vitro studies contributed to the conclusion that these compounds act as anti-cancer agents through an inhibition of tubulin polymerization1. The mammalian brain tubulin used in the screens was prepared by Cytoskeleton and used in an absorbance-based polymerization assay modified by Cytoskeleton scientists (Fig. 1A). Figure 1. Purity of tubulin and polymerization curves. A. 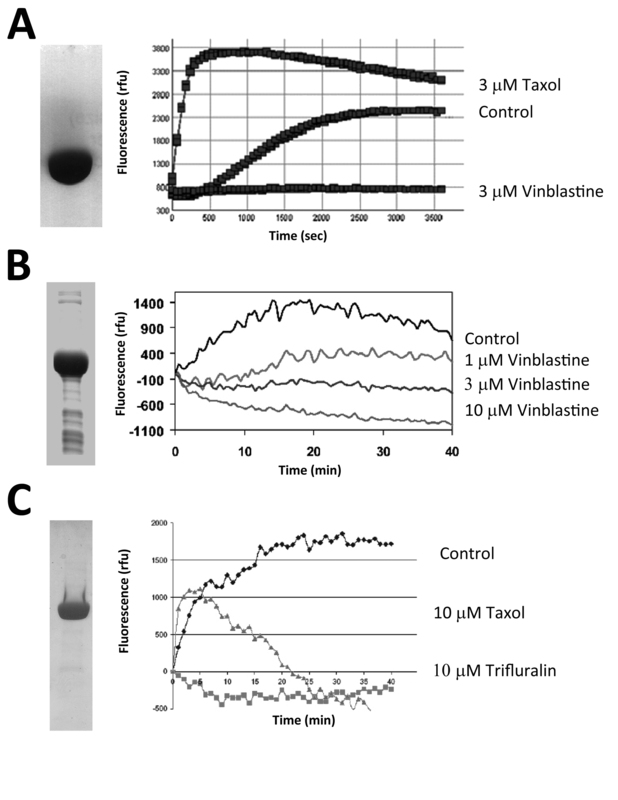 Purity of mammalian brain tubulin and polymerization activity with control buffer, taxol, or vinblastine. B. Purity of HeLa cancer cell tubulin and polymerization activity with control buffer and vinblastine. C. Purity of soybean tubulin and polymerization activity with control buffer, taxol, and trifluralin. Similarly, the second citation2 involves purification of brain tubulin with or without microtubule-associated proteins (MAPs) along with purification of tubulin from HeLa cancer cells. Cytoskeleton’s Custom Services scientists used these tubulins to evaluate the antimitotic effects of disorazol E1 using modified tubulin polymerization assays developed by Cytoskeleton. Cytoskeleton’s tubulins and polymerization assays (Fig. 1B) were used to calculate IC50 values for this compound, helping to confirm its strong anticancer properties in vitro and qualifying it as a candidate for further in vivo anticancer studies2. Tresch et al.3 utilized Cytoskeleton’s Custom Services to produce soybean tubulin and develop a modified tubulin polymerization assay. The authors used these reagents to investigate in detail the mode of action of the herbicides flamprop-M-methyl and its biologically active metabolite flamprop, focusing on the herbides’ effects on in vitro plant (soybean) tubulin polymerization. 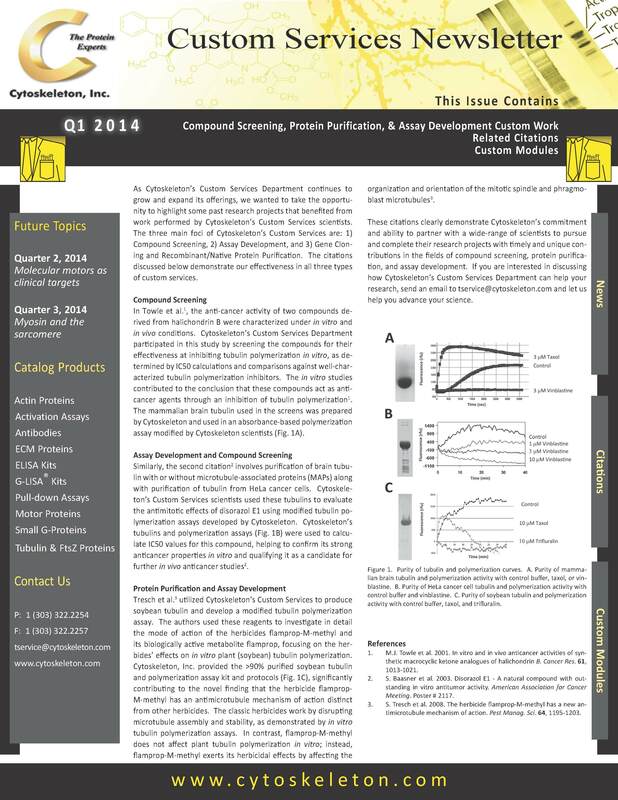 Cytoskeleton, Inc. provided the >90% purified soybean tubulin and polymerization assay kit and protocols (Fig. 1C), significantly contributing to the novel finding that the herbicide flamprop-M-methyl has an antimicrotubule mechanism of action distinct from other herbicides. The classic herbicides work by disrupting microtubule assembly and stability, as demonstrated by in vitro tubulin polymerization assays. In contrast, flamprop-M-methyl does not affect plant tubulin polymerization in vitro; instead, flamprop-M-methyl exerts its herbicidal effects by affecting the organization and orientation of the mitotic spindle and phragmoblast microtubules3. These citations clearly demonstrate Cytoskeleton’s commitment and ability to partner with a wide-range of scientists to pursue and complete their research projects with timely and unique contributions in the fields of compound screening, protein purification, and assay development. If you are interested in discussing how Cytoskeleton’s Custom Services Department can help your research, send an email to tservice@cytoskeleton.com and let us help you advance your science. M.J. Towle et al. 2001. In vitro and in vivo anticancer activities of synthetic macrocyclic ketone analogues of halichondrin B. Cancer Res. 61, 1013-1021. S. Baasner et al. 2003. Disorazol E1 - A natural compound with outstanding in vitro antitumor activity. American Association for Cancer Meeting. Poster # 2117. S. Tresch et al. 2008. The herbicide flamprop-M-methyl has a new antimicrotubule mechanism of action. Pest Manag. Sci. 64, 1195-1203.